Methi Chicken is the delicious and very simple dish cooked with chicken and fresh Methi( Fenugreek) leaves, a Win - Win Combo for sure. Some use dried methi leaves too. Can't comment much on it as I am yet to try it with dry Methi leaves. 1. Clean, wash and chop Methi leaves and keep aside. 2. Heat 2 tsp oil in a kadai and add chopped onion to it. Fry till onions turn slightly brown in color. 3. Add Ginger- garlic paste and saute it for 2 mins. 4. Now add chopped tomatoes and saute it for a minute. 5. 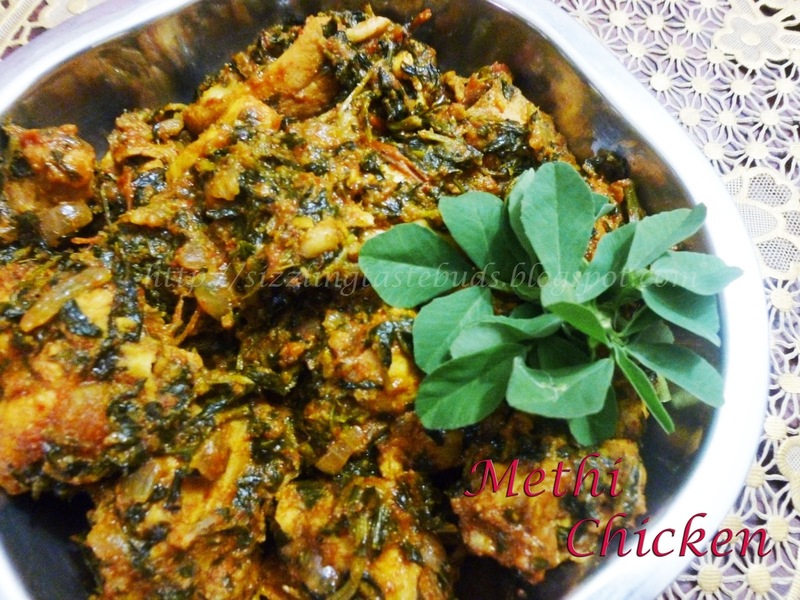 Add cleaned and chopped fresh methi leaves and mix well. 6. When methi leaves and tomatoes starts getting softer, add haldi, red chilli powder, and coriander powder. Saute it for 2 mins. 7. Now add cleaned chicken pieces and mix well. Close the lid and cook the chicken in low- to- medium flame without adding water. 8.Check in between and add salt. Pour very little water if needed. 9. Cook till chicken gets cooked completely or till you see some oil oozing out which indicates the dish is ready. 10. Hot and spicy Methi Chicken is ready to be served. Best served as a side dish to rice and sambar/ rasam or with dosa's/ chapati's. Wow Supriya, that chicken dish looks awesome!! I love adding greens in my non-veg dishes, extra boost of color, flavor and health!! Delicious and flavorful chicken dish!! 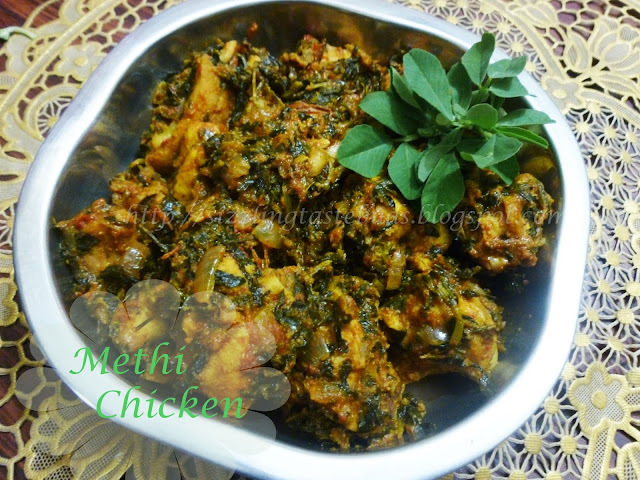 Nice Methi Chicken chicken recipe it's of nice and awesome one. The chicken is always the lovely and juciy. Great post. Thanks for sharing the idea and Recipe. Here while searching i found this food.